3. Account ‘for purchases and salesof rnerchandlse in a perpetual inventory system. It’s urban’, it’s trendy, It’s … Sears? Not quite. ~ut after decades of closing stores in ~ltIes and building them in the suburbs, Sears, Roebuck & Co. is changing course. 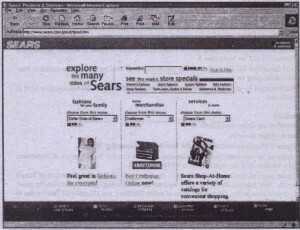 In 1996, Sears opened three full-line stores in’ metro Los Angeles, one in Queens, N.Y., and another in downtown Oakland, Calif. 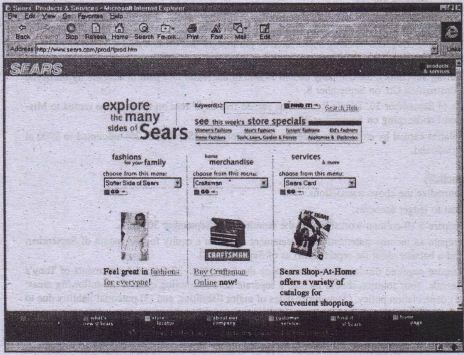 This year, . . sears is opening a Brooklyn store, bidding’ Qn’a mid-Manhattan site, and may acquire real estate in . .. . Harlem .. The company is also scouting locations in Chica~o, Detroit, Philadelphia, San Francisco, and Washington, D.C. So far, Sears’s bet on downtown stores seems to be paying off. Rents are hlghe.r than those on Sears’s sub Urban stores, bu. the volumes are higher. The new stores average between $75 mlillon·.and $100 million in annual sales, almost triple the chain wide avem;:;e. “Our metropolitan stores have really performed, and that’s not going unnoticed within our corooranen,” .say~Anan B. Stewart, Sears president for retail stores. In the preceding chapters we examined organizations that render services to their customers. Merchandising companies earn most of their revenue by selling goods. Goods that are purchased for purposes of resale to customers are called inventory. The success of most merchandising companies depends on their ability to acquire, distribute, and sell inventory quickly. . In many cases, inventory is a relatively “liquid” asset-that is, it usually is sold within a few days or weeks. For this reason, inventory appears near the top of the balance sheet, .immediately below accounts receivable. 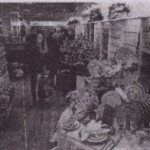 Most merchandising companies purchase their inventories from other business organizations in a ready to- sell condition. Companies that manufacture their inventories such as General Motors IBM, and Boeing Aircraft, are called manufacturers, rather”than merchandisers. The operating cycie of a manufacturing company is longer and more complex than that of a merchandising company, because the first transaction-purchasing merchandiseis replaced by the many activities involved in manufacturing the merchandise. Our examples and illustrations in .this chapter are limited to companies that purchase their inventory in a ready-to-sell condition. The basic concepts, however, also apply to manufacturers. Revenue from sales represents the sales price of merchandise sold to customers during the period, The cost of goods sold, on the other hand, represents the cost incurred by the merchandising company. for purchasing these goods from the company’s suppliers. The-difference between revenue from sales and the cost of goods sold is called gross profit (or gross margin). 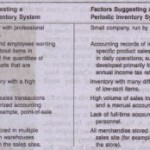 What Accounting Information Does a Merchandising Company Need? In most respects, the information needed for income tax purposes parallels that used in the financial statements. Differences between income tax rules and financial reporting requirements will be discussed in later chapters. we have been.posting transactions only i~ general ledger-accounts. These· general ledger accourits are used to prepare financial statements and other accounting re- . J’Ot1S that summarize the financial position of a business and the results of its operations. Although general ledger accounts provide a useful overview of a company’s financial activities, they do not provide much of the detailed information needed by managers and other company employees in dally business operations. This detailed information is found in accounting records called subsidiary ledgers. Most businesses maintain a number of different subsidiary ledgers, each providing ‘detailed information about a different general ledger account. A general ledger account that summarizes the content of a subsidiary le.dger is called a controlling account (or’ control account.) ‘. .
For ‘convenience, the word “subsidiary” can be omitted in’ describing’ a specific subsidiary ledger. 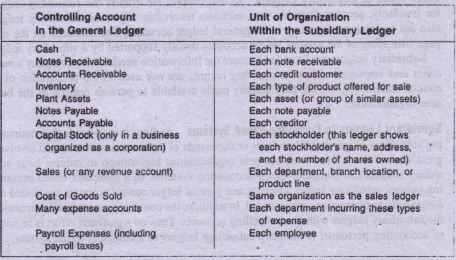 Thus the accounts receivable-subsidiary ledger might simply be called the accounts receivable ledger (or customer ledger). In this chapter we discuss the subsidiary ledgers for inventory, accounts payable, and accounts receivable. However, .subsidiary ledgers also are maintained for many other general ledger accounts. The schedule on the next ‘. 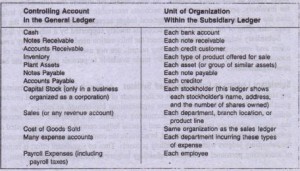 page lists some of the general ledger accounts usually supported by a subsidiary ledger. Subsidiary ledgers are intended to meet the information needs of the company’s managers’ and employees. These accounting records are not used in the .preparation of financial statements, nor are they usually’ made available to persons outside of the business organization. In a perpetual inventory system, merchandising transactions are recorded as they occur. The system draws its name from the fact that the accounting records are kept perpctually up-to-date: Purchases of merchandise are recorded by debiting an asset account entitled Inventory. When merchandise is sold, two entries are necessary: one to recognize the revel/Lie earned and the second to recognize the related cost of goods sold. 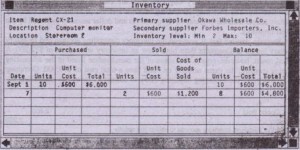 1 This second entry also reduces the balance of the Inventory .account to reflect the sale of some 01″ the company’s inventory. .The data contained in this entry are posted to the general ledger and to the subsidiary ledgers. 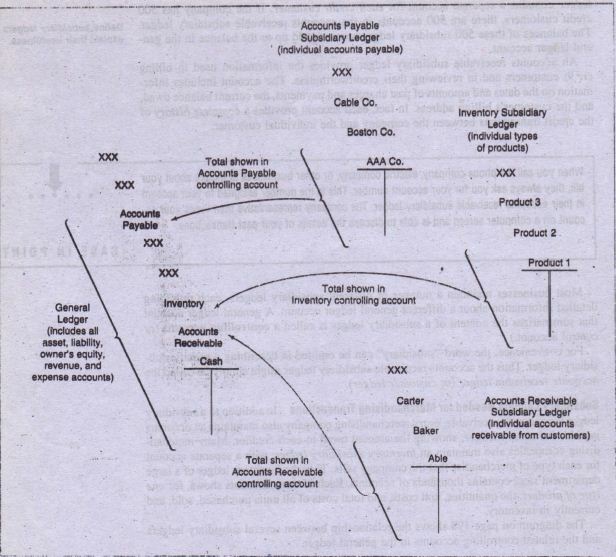 First, the entry is posted to the Inventory and Accounts Payable controlling ac counts in the general ledger. The debit to Inventory also is posted to the Regent CX-21 Monitors account in the inventory subsidiary .ledger,2 The quantity of monitors purchased (10) and the per-unit cost ($600) also are recorded in this subsidiary ledger account. (This subsidiary ledger account is illustrated on the following page.) 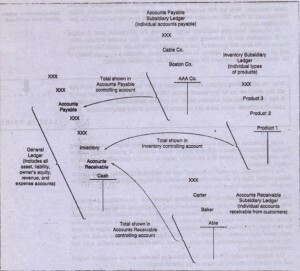 The credit to Accounts Payable also is posted to the account for Okawa Wholesale Co. in Computer Barn’s accounts payable subsidiary ledger. Sales managers use the inventory ledger to see at a glance which products are selling quickly and which are not. 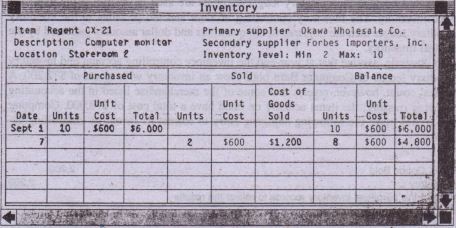 Accounting personnel use these records to determine the unit costs of merchandise sold. 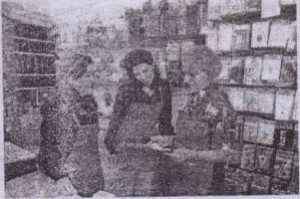 Sales personnel use this subsidiary ledger to determine the quantities of specific products currently on hand and the physical location of this merchandise. The basic characteristic of the perpetual inventory system is that the Inventory account is continuously updated for all purchases and sales of merchandise. When a physical inventory is taken, management uses the inventory ledger to determine on a product by- product basis whether inventory on hand corresponds to the amount indicated in , the inventory subsidiary ledger. Over time normal ~nventory shrinkage usually causes some discrepancies between the quantities of merchandise shown in the -inventory records and the quantities actually on hand. Inventory shrinkage refers to unrecorded decreases in inventory resulting from such factors as breakage, spoilage, employee theft, and shoplifting.